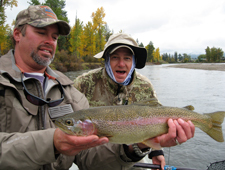 Click here for Current Conditions on the Bitterroot River. The total length of the Bitterroot River is 75 miles at the confluence of the east and west fork near Conner, Montana. However, if you include these two outstanding tributaries, there would be well over 100 miles of Blue-Ribbon trout water! The best way to describe the Bitterroot River, is a braided meandering stream. It follows along the Bitterroot Valley, lined by birch trees with the Sapphire Mountains to the east and the rugged Bitterroot Mountains at a distance to the west. A short drive over the Bitterroot Mountains would actually put you in Idaho. 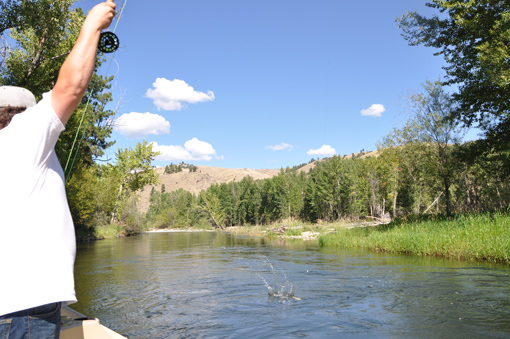 When fishing the headwaters around Darby Montana, the Bitterroot River is a smaller river with faster water and cutthroat trout being the predominate species. As the river flows toward the north, it increases both in width and volume. Here, the chance of catching more browns and rainbows is more likely. Depending on the time of the year we use a variety of different fly-fishing techniques. We use streamer fishing, nymph fishing, and dries. 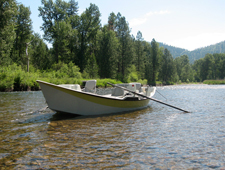 The Bitterroot River is also world famous for its Skwala hatch. This hatch happens in the months of March and April, with a good mix of drakes and smaller stoneflies thrown in. This season offers the chance to catch some of the biggest fish of the year, as the trout awaken from a winter slumber. After these two months of amazing fishing, the Bitterroot River experiences run-off from the winter snowpack, and doesn’t usually become fishable again until around the end of June. It finishes the season strong again, with another somewhat unique hatch, a large mayfly called the Hecuba. This hatch continues through the months of September and October. 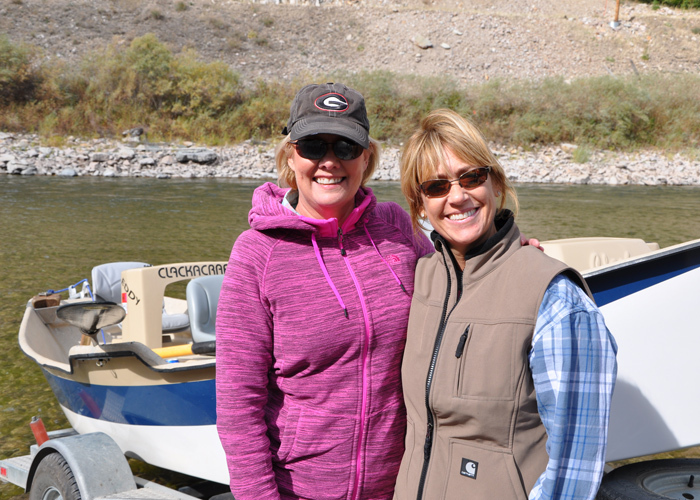 Get more information about our guided fly fishing trips! Get up-to-the-minute specs on Bitterroot River fly fishing and much more!